The Photos app on your Windows 8 tablet, just like the People app, makes the rounds of your social networks, picking up any photos it can find. Open the Photos app with a tap of its Start screen tile, and the results appear. Tap the storage area you want to open. 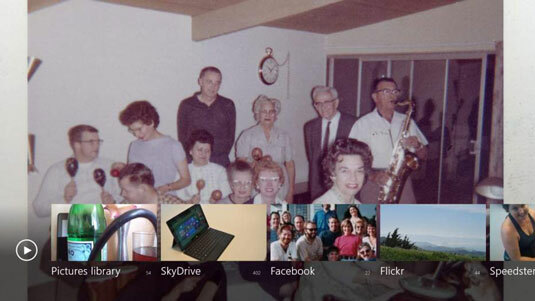 To view photos stored directly on your tablet, including ones shot with your tablet’s camera, tap Pictures Library. If you have Internet access, tap the other tiles to view photos stored online. Tap the Pictures library tile, for example, and the screen shows tiles representing each folder inside that library. Tap a folder to open it. To back out of a folder, tap the backward-pointing arrow in the top-left corner. Keep tapping the arrow, and you’ll eventually return to the Photos app opening menu. Tap a photo to view it full screen. When the photo fills the screen, zoom in or out by pinching or stretching the photo between your fingers. To see its menus, slide your finger up from the screen’s bottom. Back Arrow: A tap of the back arrow in the upper-right corner returns you to the folder containing the currently viewed app. 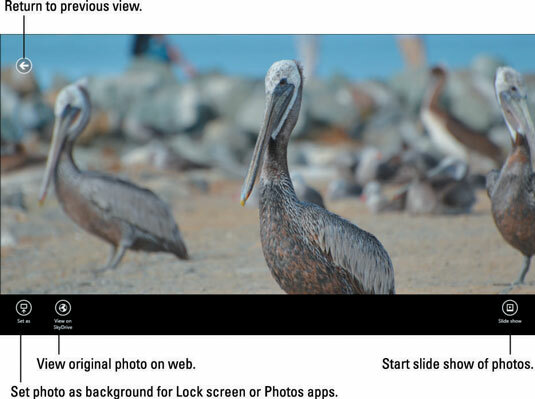 Set As: This opens a pop-up menu, letting you turn your currently viewed photo into the background for your tablet’s Lock Screen, the background for the Pictures app, or the Picture app’s tile. View on Web: Seen only when viewing photos stored online, this takes you to the photo’s location on Facebook, Flickr, SkyDrive, or elsewhere. Slide Show: A tap of this button launches a slide show of every photo in the currently viewed folder. To stop the show, tap a photo. Browse by Date: Seen when viewing folders, this lets you view your photos in chronological order, handy when showing a timeline of your vacation photos. Tap the Import button to import photos from an attached camera or your memory card. When displaying a single photo full-screen, the app bar offers buttons for letting you rotate and crop the image, handy for making profile photos out of group shots.